I understand Safia is unable to lead her hike this Sunday, so i propose this replacement. A moderate 14 km circular hike up the lower slopes of Sierra Bermeja to the Acedia gorge before heading back down the Pasada del Pino, passing a vulture feeding station before heading back to the start point. On a clear day we will have great views of Sierra Bermeja and Gibraltar. 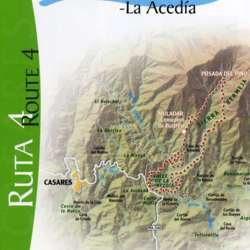 Please arrive at the meeting point by 9.45 as we will start the hike promptly at 10.00. The meeting point is the mirador car park about Protected content past Venta Victoria on the MA Protected content going from Casares Costa towards Casares. This hike has a distance of about 14km and it will take approximately 4 hours, depending on our pace. There will be an elevation difference of 490m. Please be aware of your own fitness level so the group doesn't have to wait unnecessary. Bring water, fruit, snacks, sandwiches or other refreshments. We will have a short break during the hike ( Protected content ). It's a good idea to bring a small first aid kit in case of accidents. All participants must have their own insurance.